Annually, the HRECC awards one Communicator our highest honor. The HRECC Communicator of the Year is a prestigious award earned by an employee who excelled in all areas of operation during the previous year. This award is given annually during National Telecommunicator’s Week, and is selected from nominations submitted by other ECC employees. The highest honor one can earn is to be recognized for their excellence by those they stand shoulder to shoulder with during the most difficult of times. This year’s award recipient received the highest number of nominations in ECC history. This alone speaks volumes for the respect and admiration their peers have for them and the job they do everyday. After being hired by the ECC, they worked diligently to commit guidelines to memory, learn the “right” way of doing things and were quickly released in all specialties of operation. It didn’t take long for this employee to become a “go-to” person for other personnel and to be well-respected by those in the field. Our recipient is intelligent, respectful of others and has a work ethic that exceeds that of most anyone I know. Their supervisor describes them as a problem solver and someone who can think outside the box to come up with a simple solution that keeps the ECC running. They are quick learning, quick thinking and quick acting. Our recipient is ready for any task and never complains about her assignment for the day. One letter of nomination noted how she is always willing to help others and another mentioned how she comes to work each day always radiating positivity. She was described as having strong and ethical values, being supportive of her co-workers and working as a team player. Another nomination noted her as a go-to person for questions and someone always there to lend a hand. From a management standpoint, this is obviously the type of employee we love to have as part of our team and this person didn’t waste any time in taking the next step in her career when she applied for an ECC trainer’s position. During the multi-faceted selection process it wasn’t hard to see how much passion and hard work this employee puts into the HRECC and every task she undertakes. She was selected as an ECC trainer and since that time has served professionally in that role offering knowledge to others while continuing to build her own knowledge and setting her trainees up for success. She is not only respected by those who work with her each day but she is respected by all members of the ECC. Her dedication and innovation was not more commonly noted than when an ECC console riser broke last year and our employee took it upon herself to saw and cut a board to fit the console and brought her makeshift keyboard desk with her to work so no one would have to suffer and wait until the repair company could get it fixed. Obviously with that story everyone who works in the ECC knows who our COTY is going to be. The Harrisonburg-Rockingham Emergency Communications Center (HRECC) held its annual awards ceremony yesterday, which coincided with National Public Safety Telecommunicators Week. The HRECC recognized a number of employees, including three Communicators who were honored for their work in administering life-saving, pre-arrival instructions through the use of emergency medical dispatching (EMD) during 2016. 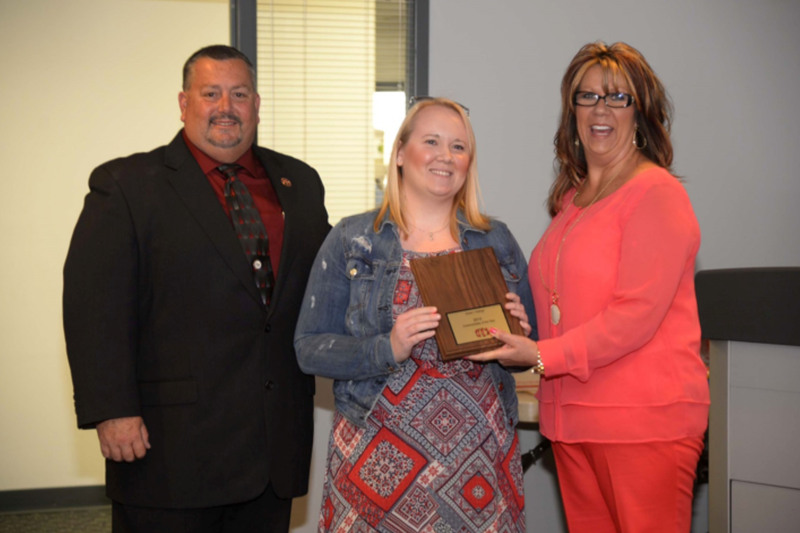 As part of that ceremony, the HRECC selected Master Communicator Kenzie Herring as the 2016 Communicator of the Year. Herring has been employed by the ECC since 2013 and she “embodies the pillars of ECC operation with her professionalism, accountability, consistency, excellence, teamwork and pride,” said Dee Dee Sencindiver, operations manager. “Kenzie makes her work in the ECC a priority,” added Jim Junkins, director of emergency communications. Herring was very familiar with public safety when she began her career in emergency communications. She grew up with a family heavily involved in law enforcement and has a true understanding of the importance her role plays for the public safety responders and the community. Members of the ECC administration were joined by Kenzie’s father, retired Rockingham County Sheriff’s Office Deputy Craig Herring, her grandfather, retired Rockingham County Sheriff’s Office Major Nelson Herring and her grandmother, retired Rockingham County Records Supervisor Marie Herring in the presentation of this award. The HRECC Communicator of the Year award is a prestigious honor that is given to one outstanding member of the HRECC annually to recognize their work in all aspects of the job. This is the 11th time that this award has been given and each time it recognized a special individual with unique abilities and contributions to the overall success of the ECC. This award is not just about one individual performance but more about a year-long dedication to the ECC, the citizens of the City and County and the public safety providers that we serve. 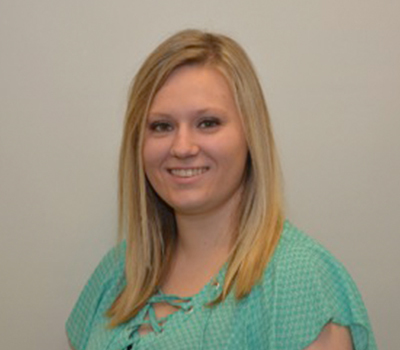 Senior Communicator Alyssa Hottinger was name the 2015 Communicator of the Year. She received multiple nominations for this award from their peers and was nominated for a variety of reasons including her willingness to help others as both a co-worker, mentor and trainer, for her willingness to put the needs of the ECC and workplace ahead of their own personal agenda, for her desire to grow in her current role and to seek out every opportunity afforded. Our Communicator of the year is selected based upon a variety of factors but one significant level of evaluation rests with not just the employee’s skill, but with what they do to make other members of the ECC better and how they put the needs of the ECC before their own personal desires. This year’s recipient has done both. During the past year this person has been heavily involved in the training of new employees. They have worked hard to develop their training skills and have become a valuable member of our training team. Our Communicator of the year is approaching 5 years of service and is steadfast in her desire to move up the career ladder of the ECC and continue to build her skills and leadership qualities. 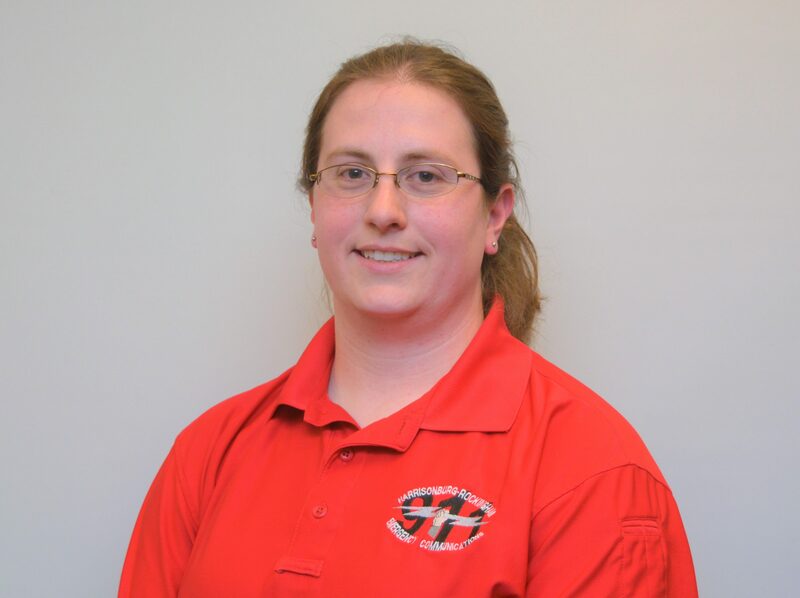 Most recently she has been added to the Telecommunications Emergency Response Team and the Harrisonburg Communications Cache. She has sought out every opportunity for promotion and sees each occasion as an opportunity for experience and growth in every area. We congratulate Alyssa Hottinger on being named Communicator of the Year.